Focussing on architecture, design and innovation, Specifier Review publishes news and views from the built environment. Showcasing the latest architectural projects, product announcements, video presentations and informative articles by building product manufacturers and construction industry professionals. This what your Specifier Review Blog Ad will look like to visitors! Of course you will want to use keywords and ad targeting to get the most out of your ad campaign! So purchase an ad space today before there all gone! 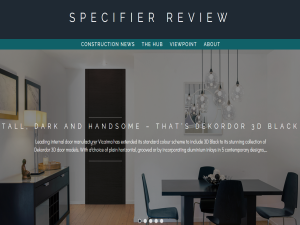 If you are the owner of Specifier Review, or someone who enjoys this blog why not upgrade it to a Featured Listing or Permanent Listing?